Or at least I hope they will be. It’s been interesting seeing their behavior and watching them cope with our upcoming move. Despite the fact that we aren’t moving until June, we had to tell the kids in January because we were prepping the house for sale and having visitors over. Ideally I wouldn’t have told them till a month or so before so they wouldn’t be stressing about it for 5 months. So we chose to be upfront about what was happening and have kept them in the loop over time. I’ve also tried to be very understanding and available to answer any question or ease any fears as they arose. Beckett, 4, has taken it pretty well with just a few bumps along the road. He’s mostly been excited and talking about all the things he wants to do when we move like surf and snorkel. And he’ll ask how many days till we move and then be disappointed when its still more than 3 days away. The worst part with him has been that he has fallen in love with the idea of playing ice hockey and begs to play daily. But no ice rinks = no ice hockey, at least for the next year. He’s starting to come around on the idea of playing roller hockey, but ice is still what he thinks about most. Its tough to hold firm to your convictions when you feel like you’re taking something away from your kids and their future. Maybe he would play and continue to play for years and years if we didn’t move, and now we’ve wiped away that option from his future. While I have some mommy guilt, I do remember to step back and realize the positives. He’ll learn lots of cool water sports, see a bunch of things he’d never see on the mainland, and odds are that we’ll end up in a hockey-playing land at some point. It’s been a very bumpy ride for Mara, who is 6. 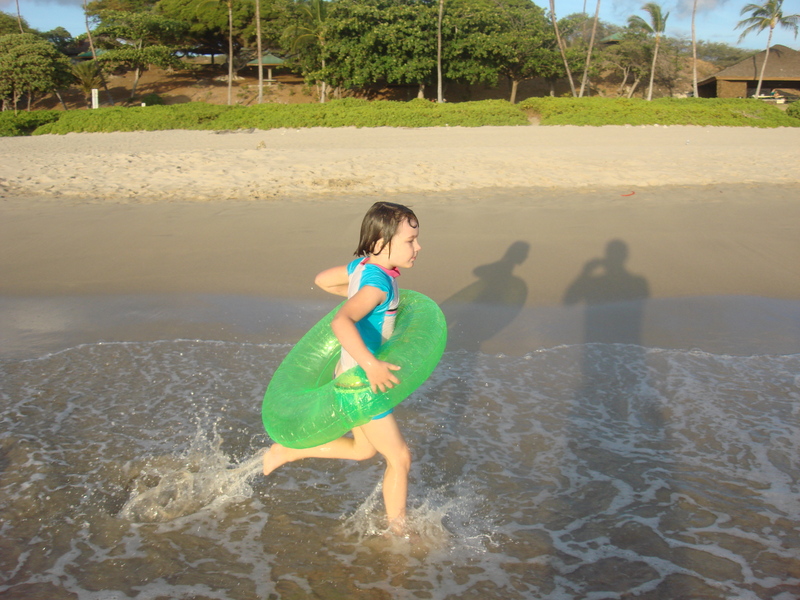 We’ve had lots of moments where she’ll excitedly tell strangers “we’re moving to Hawaii!”. And declarations of “I can’t wait to snorkel with daddy again”. It broke my heart every time and made me question what we’re doing and if it was really ok to move them away from everything they know. I’ve tried to give them as much control over what we’re doing as possible. I gave them both a box and let them decide what to put in the box to ship to Hawaii and what they were ok with leaving behind. This exercise helped tremendously. I’ve left the box in their rooms so they can change what they want to take and leave over time. I did the same thing in their playroom and promised that what they put in the box, we would ship. I also got them on board with selling their toys by explaining that some items like her dollhouse and their bikes were too big to ship, but we’ll take the money we made selling them and let them pick out replacements once we get there. Mara also got a portion of the proceeds from selling a few of her items which I think single-handedly made her ok with selling things. I think she loves money more than stuff. Mainly, we’ve just had to hang on for the ride and talk to them, listen to them, and assure them along the way. With 2+ weeks to go, the kids are at a great point. Mara is taking all the selling and transitioning in stride and seems to have accepted what is happening. Dare I say she even has moments of looking forward to it. And Beckett keeps asking if we can leave tomorrow. I’m sure there will be bumps the next couple of weeks as they say goodbye to their friends and their house. And there will be even more as we get there, and try to find a place to live and then settle into a new house, new school, new friends and a new routine. The best I can do is to be there for them. And hope we’re making the right decision. And hope that the kids will in fact, be all right.